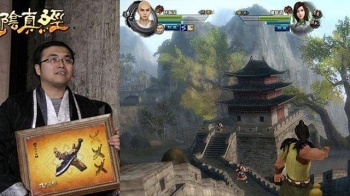 Snail Games' upcoming Age of Wulin has brought in over $21,000 before its release by selling virtual goods that don't exist yet. During a recent auction for the soon-to-be-released martial arts MMO, Age of Wulin, one excited gamer purchased an exclusive in-game sword for just $16,000 before even playing the game. At the same event, someone else bought a Hook of Departure sheath for a paltry $1,600, and another walked away with a Lordly Spear sheath for a mere $2,500 (apparently fashionable scabbards are a big deal in ancient China). Adventurers and heroes of the martial arts world are called the Wulin. stands for duty, honor, righteousness, courage but also mercy. This isn't the most outrageous microtransaction purchase we've heard of, but at least most others are for games that have already accrued a decent following and shown proven sustainability. Free-to-play MMOs are extremely commonplace, especially in China, so who's to say that this one is going to be any good, or even still around come a year from now? When you hear about purchases like this, it's easy to ponder what this man would have been able to achieve had he not invested so heavily in those 2,000 pixels shaped like a Chinese blade. Just think about all of the responsible purchases he could have made instead, like 6,425 Asiago bagels smothered with cream cheese, 128,859 Crayola crayons in twelve different colors, or an original Jurassic Park pinball machine for each room in his house. What a waste. Let's just hope for his sake that this game doesn't have open corpse-looting during PVP, otherwise I'm setting up an account and ganking that dude's sidearm first thing.